Note: these splitters do not work like hubs; they must be used in pairs and you must have 2 ports available at your hub for each splitter pair used. Please refer to the illustration. Our popular Y splitters let you connect 2 computers to 2 switch ports on your switch or hub through a single patch cable. This is accomplished by utilizing two pairs of wires in standard network cable that are unused by 10/100 Ethernet. It's like doubling a network connection without pulling a new cable! 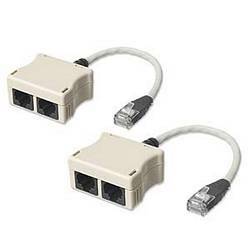 Used in pairs, one adapter combines two data signals at the wall jack; both signals are carried through one network cable and a second adapter separates the signals allowing two connections at your hub or switch. Add a 10/100 Ethernet connection without pulling a new patch cable! Pros: I have both a server and a workstation going into one ethernet port with this setup, and both split out and go into two ports on the rack in the network cable room. NO lag in speed detected (base 100 speed) versus using the port by itself without the splitter. It works great, and the entire office (12 workstations) can access the server at the same time as me. NO issues in 6 months of 24/7 usage. 13 out of 13 find this review helpful.